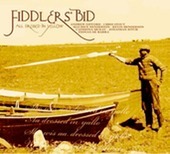 Fiddlers Bid - All Dressed in Yellow: The Shetland Band's latest release All Dressed in Yellow is an eclectic mix of traditional and contemporary styles, both in melody and arrangement, played by a mature, innovative band combining outstanding musicianship. The album could be described as a suite of music lasting almost 45 minutes where the arrangements border on orchestration. Scotland on Sunday reviewer Norman Chalmers says of 'All Dressed in Yellow', a tour-de force of rhythmic, melodic and harmonic imagination in but six tracks. Naked and Bare * White Wife * Troila Knowe * Waltz From Orsa * Fezeka's * Jim Craig's Set * Christchurch Cathedral * Seven Step Polka * Da Kirk Stack * Faroe Tune. With their four-fiddle front line, backed by a powerhouse of piano, bass, guitar and Scottish harp, they create a display of stunning virtuosity. Their exhilarating sound is developed from Shetland's rich tradition of fiddle music, but given a fresh approach by the fiddlers and backed by the driving rhythm section. This is the band's third album on Greentrax, following their 2001 recording Da Farder Ben Da Welcomer - the label's best selling album of 2002. Kevin and Maurice Henderson (fiddle), Chris Stout (fiddle, viola), Andrew Gifford (fiddle, guitar), Catriona McKay (Scottish harp, piano), Fion�n de Barra (guitar) and Jonathan Ritch (bass guitar). "Nothing, I repeat nothing, could possibly prepare an audience for the musical tornado known as Fiddlers' Bid"
"This thrilling seven-piece outfit is currently one of Scotland's hottest musical exports"
"If they don't sweep you away, check your pulse"
"One of the most exhilarating acts on the scene"
"For exultant ensemble synergy and irresistibly infectious gusto, there's no beating Fiddlers' Bid"
A simply sensational Shetland band. It is difficult not to leap to your feet when the band is in full flight and the level of excitement generated at the band's concerts is amazing. The band's sound is quite unique and has been developed from Shetland's rich tradition of fiddle music but given a fresh approach by the four outstanding fiddlers, backed by the driving rhythm section of acoustic guitar, bass and keyboards, and of course the addition of the Scottish harp.. and sheep. Oh and watch of for the peerie surprise at the end?!! This their third album, comprises many traditional and contemporary tunes, some written by Band members, but mainly from the Shetland Islands, where their roots lie. 12 tracks: Da Sneck o' da Smaalie, Yellow Stockings, Hamnataing, Da Sabbit Prawn, The Seagull, The African Set, Inisheer, Skye Barbeque, Michael's Mazurka, The Isle of Aigas, The Trows, Da Tief Upon da Lum. Shetland's sensational young band features four dynamic fiddlers backed by a driving rhythm section creating an exhilarating sound. Featuring Chris Stout, Andrew Gifford, Maurice Henderson, Kevin Henderson (fiddles), Catriona MacKay (keyboards and clarsach), Steve Yarrington (guitar) and David Coles (bass).